Promise, this is real. 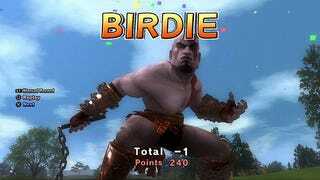 Sony have announced that, as of this Thursday, you'll be able to download Kratos as a playable character in Hot Shots Golf: Out of Bounds. There he is above, rendered all cartoon-like, taking his one-under-par very, very seriously. Kratos' voice actor from the "proper" GoW games - T.C. Carson - provided the voice work for the cameo, and this cutesy God of War will even use the chain blades as a club. There's another pic after the jump, but no, this one won't make him look any less out of place.